Custom Cartoon Illustrations for your Website? As a graphic and website designer sometimes my design tool of choice is simply a piece of paper and a pencil. This is especially so when a web site calls for custom cartoon illustrations, these work really well on websites targeted towards kids. The result is a very original feel to the graphics of the final site. 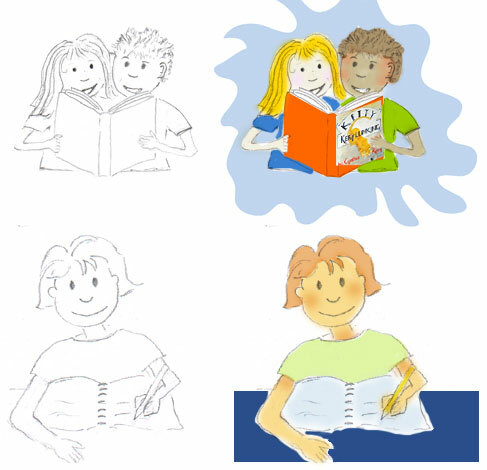 Here are some examples of custom illustrations I created for children’s author Cynthia Reeg. I let my pencil flow freely, scanned the drawings and imported them into Adobe Photoshop. Then they were brought to life with the magic of color. The graphics for Cynthia’s site are incorporated into the template of the page, used as navigational elements and add interest to sections of the site. Although all different they have a very branded feel due to the hand drawn and colorization techniques used. This entry was posted in Chicago Graphic Design, Design Snippets. Bookmark the permalink.